Spring is taking it’s own sweet time this year. Last year we had a week of 90° days in March that caught me off guard with all my summer clothes still packed away in the back of the closet. This year the t-shirts and shorts have all been swapped for sweaters and corduroys, but Mr. R sighed in relief to find out my landlord hadn’t yet turned off the heat. 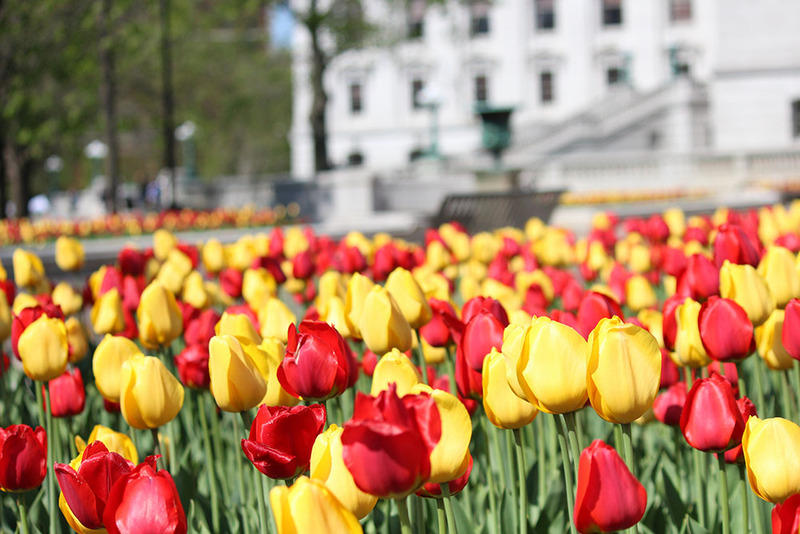 It may still be chilly and surprising us with late season wintery precipitation, but at least the flowers and trees around Madison have finally decided that spring is here. The cold spring also means that even though the farmer’s market moved back out to Capitol Square 4 weeks ago, the produce is getting a slow start too. Asparagus and green onions finally showed up on Saturday, but I had my eye out for something else. I was looking for rhubarb. 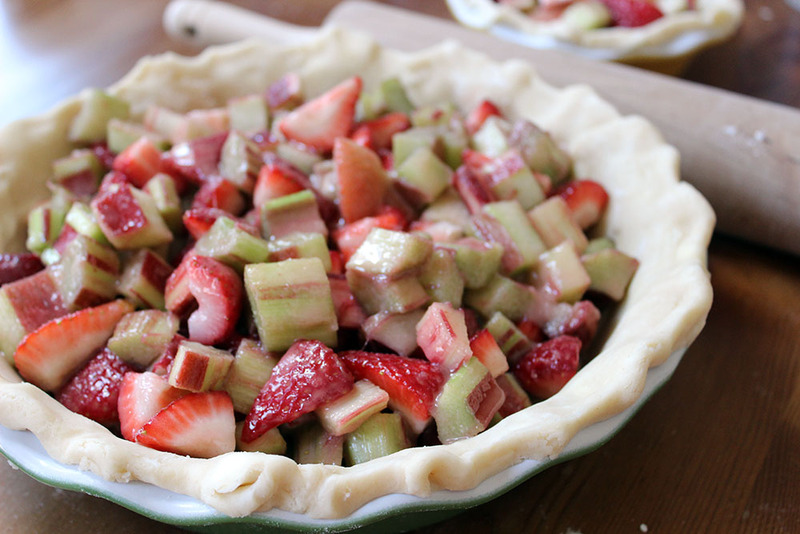 I think I have an internal pie clock because even though I don’t like pie too much, every year about this time I start itching to pull a bubbling, sweetly tart smelling strawberry rhubarb pie out of my oven. And every October I’m not satisfied until I’ve turned a couple sugar pumpkins into cinnamon, clove, and ginger spiced comfort. The market sadly didn’t deliver on Saturday, so I had to hunt the rhubarb down at the grocery store this morning. I felt a little disappointed as I dug through the stack of pre-cut stalks on styrofoam trays. 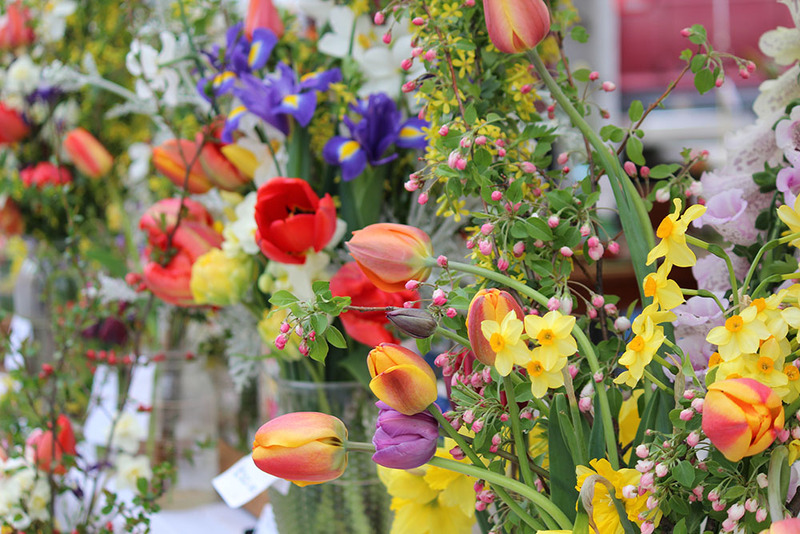 Thin, brightly hued pieces on top hid thicker, discolored stalks below. The sign indicated they were coming from Washington. I should wait, I thought, in a few weeks the local stuff has to come in. Patience is a virtue. But…. I have the patience of a kindergartner. That is, I have none. Truthfully, I guess I have a little. I have enough to wait for this pie to cool fully before I dig in, but I don’t have the patience to wait for Spring anymore. So, I’m giving spring a hint; we’re all ready! Maybe when it warms up, I’ll make another to celebrate. 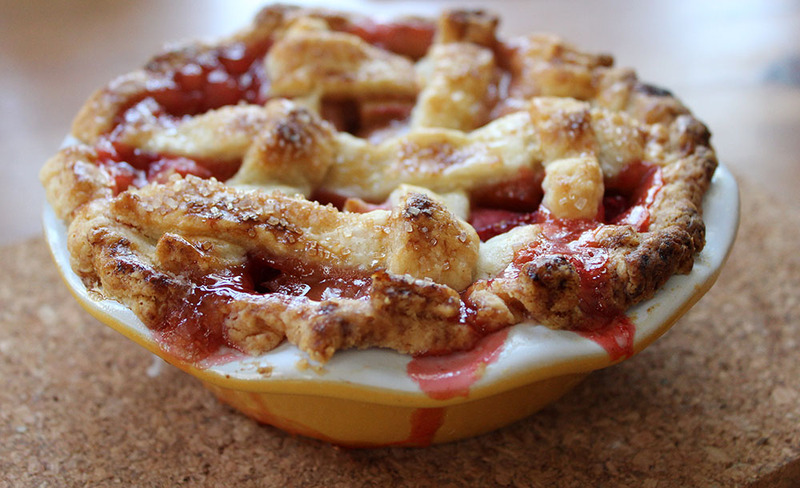 You’ll need about 2 lbs of rhubarb and 1 lb of strawberries. 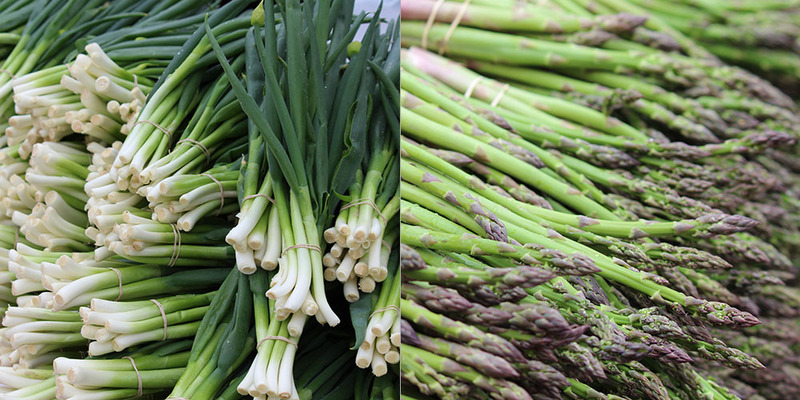 Whether or not you wait for your local produce to come in is up to you… Rinse. Trim the tops off the strawberries and quarter. 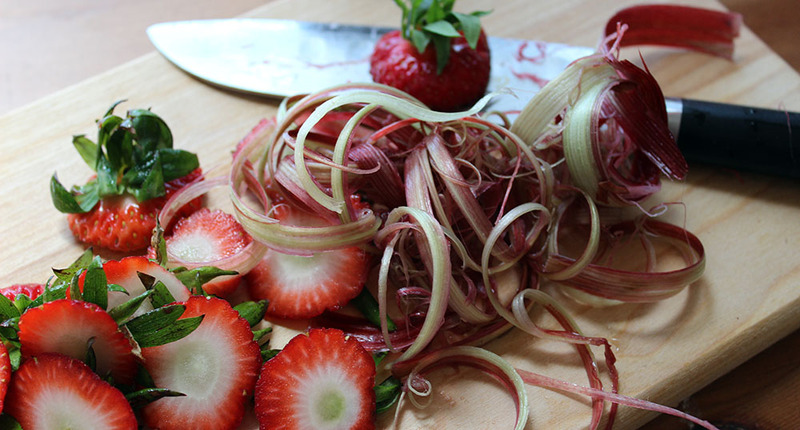 Peal the stringy outer layer from the rhubarb with a vegetable peeler and cut into 1/2 inch cubes. Make (or buy) your preferred pie crust, enough for a double crust. My go to recipe is the combination butter/shortening recipe here. Make a lattice top. Brush with beaten egg yolk and sprinkle with sugar for a golden crust. Wait until it cools fully. If immediate gratification is more your style, grab a spoon and please try to wait long enough so you don’t burn your tongue on molten strawberry rhubarb juices! You have a lot of options for pie filling thickeners: flour, cornstarch, tapioca, clear-gel. I prefer tapioca, but will use cornstarch as my second choice if I forget to grab tapioca at the store. I never use flour because I don’t think it does a good job of thickening all the juices that the fruit releases during cooking and the result is a very soggy pie. Preheat oven to 425°. Make your pie crust and put it in the freezer to chill. 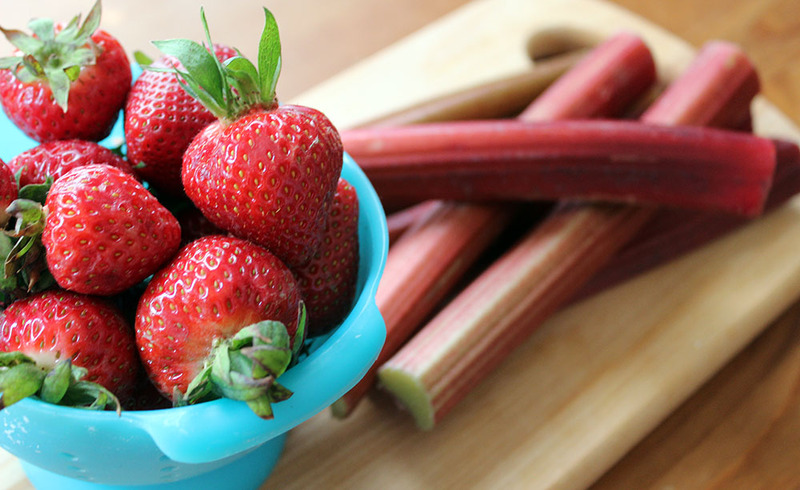 Prepare your rhubarb and strawberries and put in a big mixing bowl. Whisk together the sugars, tapioca, salt, lemon zest, and cinnamon. Pour the sugar mixture over the fruit and toss everything together. Roll your bottom pie crust and gently place it into your pie dish (10 inch or deep dish) without stretching. 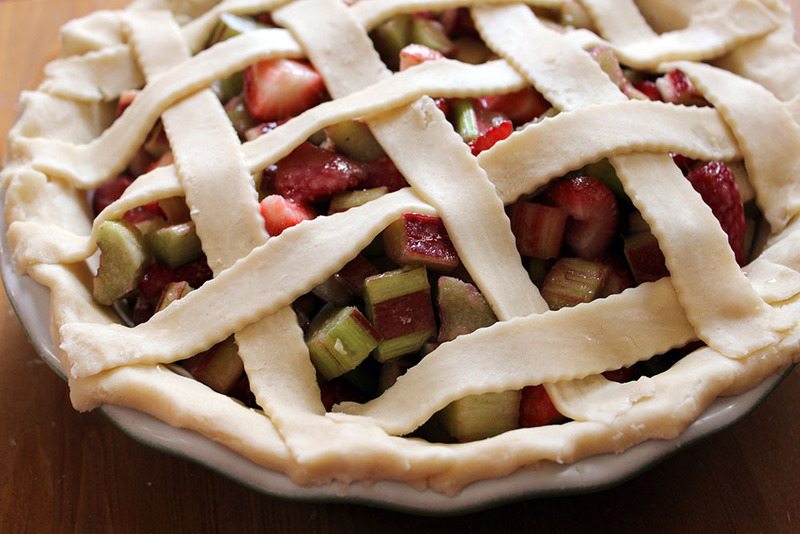 Trim the edges then pour the fruit into the crust and dot with butter. Roll your top crust and cut into strips for a lattice or keep whole. Cover the fruit (if using a full top crust remember to cut vents with a knife). Brush your crust with some egg yolk beaten with a Tbsp of water and sprinkle with sugar. Place the pie dish on a rimmed baking sheet and bake for 20-30 minutes. Lower the oven to 350° and bake for another 30-40 minutes until the juices are bubbling and thickened. If the crust is browning too much, you can cover the pie with foil and then remove it for the last 5 or 10 minutes of baking. Cool the pie fully on a wire rack and store in the refrigerator.